What if your extracurricular activities weren't just extra but a part of your academics too? New thinking on education intends to bring students' interests into the classroom. It's called Connected Learning and promotes the idea that students will excel in school if what they are learning is relevant to their lives, experiences, and passions. This plan is spelled out in a new report, by Mimi Ito, the research director of the Digital Media and Learning Hub at the University of California Irvine. Ito uses the Harry Potter Alliance to demonstrate how Connected Learning’s can be effective. She says, “the HPA connects young people who are inspired by the civic virtues portrayed in the Harry Potter books, and want to apply them to the real world.” This fan network organizes over social media platforms (Facebook, Livestream, Youtube, Twitter) to spread awareness and solutions to issues like, equality, and human rights, and to support of charitable causes. Literacy has been a central focus of the group. Their annual book drive has brought 85,000 donations since 2009 and contributions have helped build a library for a charter school in NYC. Ito says another prime example of Connected Learning is at Youth Radio. The youth-driven media organization channels young peoples' passions into education and job training. For instance, the poetry group inside Youth Radio, Remix Your Life, helps strengthen students’ writing skills, public speaking and presentation skills while providing an outlet for us to express what we're passionate about. students to write and perform short plays based on fairy tales, to design and orchestrate a series of outdoor games for an end-of-the-year field day, to research and construct a travel website featuring three NYC neighborhoods, to build a sculpture from recycled materials, and so forth. In each case, Boss Levels attempt to weave together connected learning principles with the strictures of school-based practices. Students drive activity during Boss Levels more than at any other time during the year. While educators put students onto teams and define the challenges, students take the lead in designing, discovering, and evaluating possible solutions. Students provide each other with ongoing feedback about each other’s ideas and work styles. They engage in delicate, and often difficult, negotiations over what their team should try next, who should do what, and who can tell or ask someone else to do something. While failure is commonplace, and while conflicts sometimes arise, educators resist intervening extensively. In general, students are active and highly engaged, and the classroom is often vibrant and boisterous. While Quest educators define Boss Level challenges, students have extensive opportunities for connecting Boss Level projects to their own interests, many of which are dissociated from conventional schooling practices. For example, when a Boss Level challenge asked students to write, stage, and perform short plays based on fairy tales, students wove numerous interests and cultural forms from their out-of-school lives into the productions. One scene took place in a medieval coffee shop called “Moonbucks”; plots and characters drew inspiration from popular books, video games, music, and movies; several students with an interest in fashion worked on costumes; a student who was enrolled in an after school program for gymnastics helped choreograph stage fights; students who participated in online fan fiction communities worked on scripts; students who were interested in media production helped with recording and mixing sound effects; all students produced daily podcasts that provided updates about their projects to family members. In doing so, Boss Level blurred conventional divisions between education and peer cultures. Boss Levels confer academic legitimacy on creative activities that are typically absent or marginalized at conventional schools. By treating Boss Level as the culminating academic experience for every trimester, and by showcasing the students’ work to family members and members of the New York City design community, Quest bestows academic legitimacy on forms of work that are not easily measured by standardized assessments. At the same time, Quest attempts to link Boss Level challenges to more widely recognized academic domains and competencies. 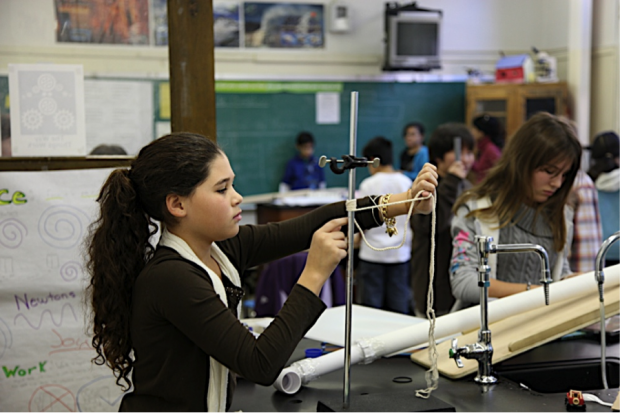 For example, the Rube Goldberg machine challenge required students to put into practice knowledge about physics and simple machines that they had been learning about over the course of the trimester. Similarly, Boss Levels encourage students to approach design challenges from the perspective of “systems thinking,” a twenty-first century literacy that educators emphasize in their instruction throughout the year. So, for instance, when tinkering with a Rube Goldberg machine, or when writing a play, or when designing a game for the field day, educators encouraged students to think of each design challenge in terms of its components, rules, goals, feedback mechanisms, and other aspects of a dynamic system. In doing so, they connect hands-on activity with forms of knowledge that are recognized in various academic and professional contexts. Realizing connected learning principles in a public school setting is not without its challenges. For one, Boss Levels can be seen as taking time away from preparing for state tests. While Quest hopes its students will score highly on tests, its students are evaluated against students who attend schools that place greater emphasis on testing. If the school cannot produce competitive test scores, many families will not apply to the school and the Department of Education could force it to change its leadership or even close its doors. Given these realities, Quest is under constant pressure to scale back on less canonical offerings such as Boss Level, and it has had to diminish the number and duration of Boss Levels as it has matured. Additionally, the school has had to educate some parents about the educational value of experiences like Boss Level. Less-privileged families, in particular, have pushed the school to focus more on canonical pedagogic offerings, in part because their children’s options in the NYC school system largely depend on test scores. Further, families from various backgrounds have expressed unease with some of the student-centered aspects of Boss Level. The frenetic, messy, and often noisy character of Boss Levels can appear to some as chaotic and undisciplined rather than as engaging and invigorating. Quest educators have responded to these challenges by attempting to educate parents about the forms of learning supported by Boss Levels, and over time many parents have come to see, and even celebrate, Boss Levels as important and unique educational opportunities. Educators have also had to make Boss Levels more structured and adult-managed as the school has matured, partly to ease parental concerns. Despite these challenges, Boss Levels offer an encouraging example of how connected learning principles can be integrated into public schooling. Unlike most canonical schooling practices, Boss Levels organize students’ activity around a shared purpose, and they provide students with numerous opportunities for active and creative problem solving. Students, rather than educators, drive the process. Solutions are not defined beforehand and resources are not bound by the school’s walls. As a result, students have the opportunity to participate in the challenging, messy, collaborative, and open-ended processes that we believe characterize connected learning at its best.